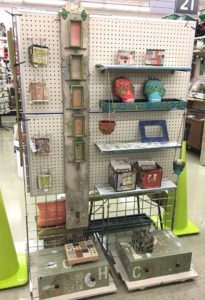 At right is a photo of my display at Schnarr’s Hardware in Webster Groves, Missouri at 40 East Lockwood. You can view my work from October 6 – October 15 2017 as part of the Old Webster Fall Art Walk. Look for the lime green cones outside Schnarr’s and other businesses in Old Webster to see where exhibits for the art walk are located. One of my favorite things to do is to find interesting salvaged materials and apply my creativity to see what I can make out of them. Don’t get me wrong, a trip to the craft store or hardware store is always a treat but sometimes all-new materials don’t give me the same satisfaction that I get from bringing something old back to life. Some materials I use are hand-me-downs or old items of mine that are no longer useful. If I can’t use a whole object that is being discarded I often scavenge parts from it. I’ve made myself some really nice things out of stuff that I picked up off of the curb on trash day. Garage sales and thrift stores sometimes yield fun supplies and I also like to look for interesting materials at non-profits that specialize in keeping things out of landfills such as Leftovers, Etc. and Perennial. Do you want some ideas for repurposing materials? I’ve written tutorials about how I made many of the items in the show. For inspiration, check out some of my projects!